AM Industrial, located on Cleveland's Industrial Parkway, received the upgrade it needed with their 30,000 square foot roof renovation. At Southwest Companies, we're proud to be a part of Cleveland's ongoing rejuvenation, and the chance to beautify our city with the latest trends in the industry. Cleveland's surging revival marks an exciting time for the residents of the cherished city, with restorations reaching beyond downtown's swanky skyscrapers. Southwest Companies, Inc. was hired to replace the roof on a waste water treatment plant building #14 for the City of North Olmsted. We are proud to service a series of building repairs at this iconic and historic landmark located in Rocky River. Tuck pointing, caulking, wash and seal, including a concrete cap restoration at Crisis Redeemer Church in Cleveland. 200 West Apartments is the proud recipient of the Northeast Ohio Apartment Association's 2015 Gold Key Award for Property Excellence. 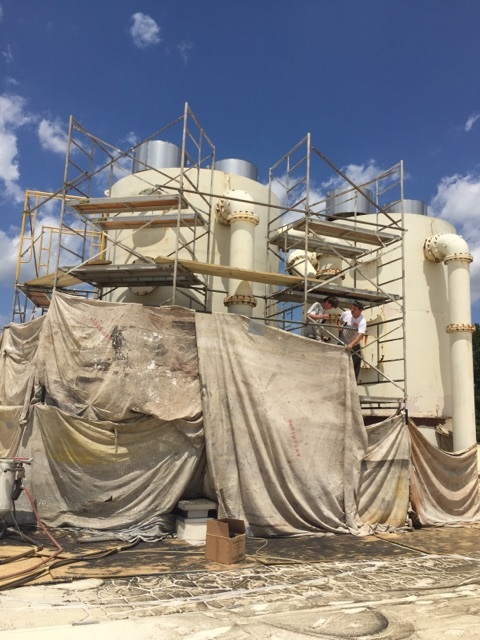 Sandblast, sealing and coating Ohiomet industrial tanks.